Cattlemen's Cafe in Oklahoma City has been serving juicy, tender steaks for decades. Oklahoma’s history is filled with tales of cowboys and cattle ranchers, making it the perfect place to get some of the best steak you’ve ever tasted. Many Oklahomans pride themselves on their ability to perfectly cook a steak, and Oklahoma’s restaurants are no different. They’ve taken a part of Western cuisine and turned it into a charbroiled art form that you can really sink your teeth into. Here we’ve put together a list of some of the best steakhouses in the state that are sure to serve you a prime cut of sirloin succulence. Founded in the early 1960s, Click’s Steakhouse in Pawnee has been preparing some of the best steaks in Oklahoma for over five decades and has the reputation to back it up. The unique aging process and preparation technique has not changed since its opening, making Click’s a local legend. Order the 14 oz. rib eye and enjoy the tender cut of beef as it melts in your mouth, or pair the slow smoked prime rib with Click’s horseradish sauce for an added spice your taste buds will thank you for. Compliment your steak with a fried delicacy such as freshly breaded mushrooms, beer-battered onion petals or pickles deep fried to a golden brown. Anyone who’s been to Click’s Steakhouse will tell you not to leave without trying their famous, homemade coconut, chocolate or lemon meringue pies, which are legends themselves. Red PrimeSteak in Oklahoma City boasts a fantastic sense of style and modern design combined with gourmet cooking. Step into the epitome of class in the renovated Buick Building in downtown’s Automobile Alley as you walk down Red’s hallway of chic neon lights to be seated. After picking your prime cut, peruse the crust and sauce choices and choose one of each for a unique flavor all your own. The brown sugar and sea salt crust gives your tastebuds the perfect combination of sweet and salty after the flavors have been fused and your steak perfectly seared. Order the Guajillo Chile crust with the jalapeno béarnaise for a more adventurous and spicy steak that will not disappoint. Compliment your steak with a wine from their extensive wine list to complete your Red PrimeSteak experience to the fullest. Open for more than 50 years, Freddie’s Bar-B-Que & Steakhouse in Sapulpa has been a fixture along Route 66 in the northeast part of the state. The most popular item at Freddie’s is a traditional, juicy steak expertly grilled and then smothered with the restaurant’s special smoke sauce right before its brought to your table. The steak dish comes with a cornucopia of delicious food such as hummus, tabouli, a cabbage roll, two ribs, barbecued bologna and even a baked potato. You can order Freddie’s steak in several delectable ways including on a shish-kabob with onion, bell peppers and tomatoes or with a lobster tail served with creamy, drawn butter and a lemon wedge. Boulevard Steakhouse in Edmond features the sophisticated atmosphere of a vintage club with a hint of Western saloon where you can enjoy gourmet Midwestern comfort food in luxury. Relax as you settle into a posh booth and look over Boulevard’s selection of prime steak cuts, each custom-aged to its peak and perfectly seasoned with Kosher salt, black pepper and just the right amount of butter. Your senses will flare in anticipation as you watch your Steak Florentine swimming in rich béarnaise sauce walked from the kitchen directly to your table. Indulge in a 7 oz. filet and cold-water lobster tail paired with fresh asparagus and hollandaise sauce or glistening sautéed button mushrooms. Don’t forget to try a fine wine from Boulevard’s international selection and pair it with a serving of crème brulee made with Tahitian vanilla for the perfect end to your meal. Your senses will flare in anticipation as you watch your Steak Florentine swimming in rich béarnaise sauce walked from the kitchen directly to your table. Named after one of baseball’s best players, Mickey Mantle’s Steakhouse aims to hit it out of the park with their prime cuts of steak. Dine in a classic, upscale environment that is both uniquely American and Oklahoman in its cuisine. Treat yourself to the filet mignon pressed in cracked peppercorn and drizzled in a decadent cognac pepper sauce with Susie’s Famous Mashed Potatoes and you’ll see why the “meat and potatoes” of Mickey Mantle’s menu is literally the restaurant's meat and potatoes. But it’s not the only thing they do well. When you’re craving seafood, satisfy it with the Blue Ribbon Filet Mignon and Australian Lobster Tail for a surf and turf delicacy in the heart of Oklahoma. With Mickey Mantle’s signature sauces and daily chef features, this steakhouse is true destination dining. With the perfect combination of modern amenities and Western art with “old world” style and atmosphere, you’ll feel both at home and surrounded by elegance at Ranch Steakhouse in Oklahoma City. The Ranch proudly serves Oklahoma grown, USDA Certified Prime tenderloins and ribeyes that make for succulent steaks delicious all on their own. However, that shouldn’t stop you from topping your whopping 24 oz. Porterhouse with sautéed jalapenos and onions to give it a kick or melted fromage for a decadently cheesy enhancement to your all natural beef. Leave room for something sweet and try Ranch Steakhouse’s Carnegie Deli Cheese Cake with fresh lemon curd and blueberry sauce topped with a hint of white chocolate shavings or bananas foster with pecan praline ice cream over rich butter cake for a dessert too good to be true. People travel from all over for a table at Warehouse Willy’s in Poteau and stay for the atmosphere, service and mouthwatering food. The décor and ambience is eclectic with neon signs, old photographs and license plates added to the walls by customers who keep coming back for more. Relax and enjoy the ever-present blues music playing over the sound system and feast on Willy’s scrumptious rib eye steaks – so good that they won the 2000 Golden Fork Award for the best steaks in the country. It’s not hard to see why the steaks at Willy’s receive such high praise, as all cuts of meat served at Willy’s have been aged, marinated and seasoned using the restaurant’s time-honored recipes. Order your perfect cut of meat alongside the gumbo made fresh daily and the “Mud Bugs,” or fried crawdads, with a homemade dipping sauce for a Cajun twist on the Midwestern staple. Settle in for a night of first class dining at Prhyme Downtown Steakhouse in Tulsa. This restaurant is a steak connoisseur’s dream with the ability to pick between American grass-fed and grain-fed cuts. Taste the difference in the equally delicious tenderloin filet, New York strip and rib-eye. It’s hard to choose between the 21-day wet aged or the 30-day dry aged meat and whether to pair your selection with a smooth béarnaise sauce or veal demi-glace. The bacon butter brussels sprouts and the buttermilk fried onion rings with Prhyme steak sauce are the perfect complement to Prhyme’s entrees. Indulge your refined palate with a fine wine with dinner, and polish off your elegant experience with carrot cake topped with candied pecans and cinnamon cream cheese icing for a slice of heaven served on a plate. Mahogany Prime Steakhouse & Wine Bar in Tulsa is committed to serving its customers the best steak cooked to perfection every time. The process begins when Mahogany’s butchers hand-select every cut of meat for a one-of-a-kind, corn-fed, beautifully marbled steak on every plate. While waiting for your entrée to be prepared, delve into servings of bacon-wrapped scallops, fried calamari or crab cakes to whet your appetite for the main course. Be waited on hand and foot and allow the staff to help you select a beverage from their impeccable wine list to bring out the rich flavors of your steak. For something extra special, order the house martini for a smooth cocktail shaken, not stirred, and prepared tableside. 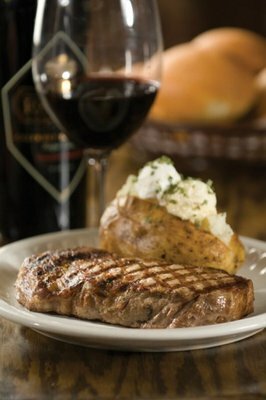 Check out our full list of steakhouses across Oklahoma and find even more delicious steak options.